Creative, eclectic cuisine offered amid a French-country ambience. 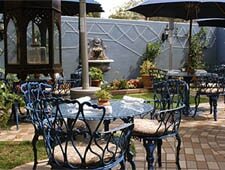 : Considering its reputation as one of Sedona’s oldest and most revered eateries, the Heartline Café’s French-country ambience creates a relaxed atmosphere, much like you’re walking into an old friend’s kitchen before a holiday meal. Fresh flowers adorn tables set with crisp linens and gleaming silver and fine china, and gracious service complements owner Chuck Cline's eclectic cuisine. The blend of American, Southwestern, Asian and Mediterranean influences shows up in creative seasonal dishes like the pecan-crusted local trout with Dijon cream sauce, or grilled filet mignon wrapped in house-cured pancetta topped with a red wine demi-glaze. The seafood is consistently fresh and soups are created with a deft hand. Opt for the outdoor garden-like setting on warm summer evenings, or if you're craving more of chef Cline's creations for breakfast and lunch, stop by the Heartline Café’s Gourmet Express dine-in and takeout location next door. Heartline is surprisingly family-friendly with a menu just for kids.